The Popcorn Bag Pattern by Aunties Two is made with 2 1/2" fabric strips filled with clothesline or cotton piping that is crocheted to create a unique textured bag. 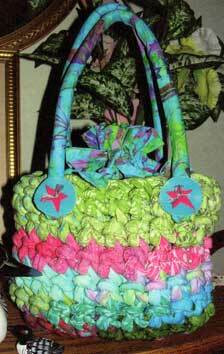 This bag can be made with Bali Pops or cut your own fabric strips! Finished size is 10" W x 7" H x 6" D.